Multiple petitions to recall Governor Snyder and legalize cannabis have been approved for circulation. 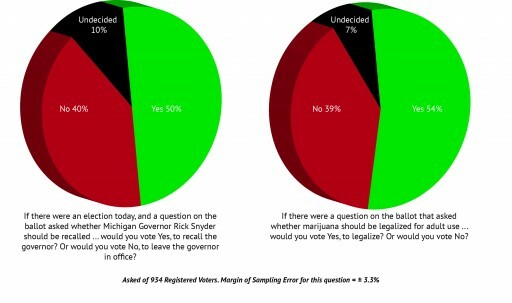 According to recent Survey USA Poll commissioned by the Michigan Medical Marijuana Report, Cannabis Stakeholders Group and Abrogate Prohibition Michigan, Michiganders would support both recalling Rick Snyder and to legalize marijuana. 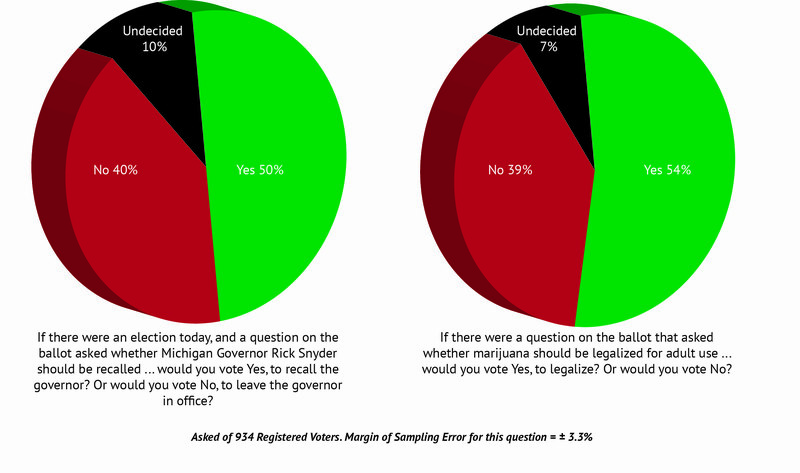 Michigan voters want to recall Governor Rick Snyder, according to a new SurveyUSA poll. 934 registered voters statewide were interviewed 03/23/16 through 03/24/16. Young voters are more likely to want to remove the Governor; older voters are more likely to want Snyder to remain in office. 85% of those who are "very liberal" want the Governor out of office, compared to 69% of liberals, 47% of moderates, 34% of conservatives and 28% of "very conservative" voters. By 54% to 39%, voters favor the legalization of marijuana for adult use. Support for legalizatioMazurn extends to all regions of the state. This Easter Sunday, the current effort to Recall Governor Snyder will begin with the petition kick-off. Pastor David Bullock from Detroit and Quincy Murphy, from the City of Flint Charter Review Commission are the lead organizers of the recall efforts and they are organizing volunteers from around the state to gather signatures to recall the Governor. Leaders of the two recall groups have joined together and will use the same petition form. There are two petitions to legalize cannabis in Michigan. MI Legalize started collecting Signatures in the summer of 2015, but failed to reach their deadline last December. Attempts to change the policy regarding the 180 day window for collecting signatures has stalled, leaving the majority of signatures “stale and void.” The Abrogate Prohibition Michigan Amendment started gathering signatures in January this year, to repeal or abrogate, the laws that make cannabis illegal under the Michigan Constitution. The Cannabis Stakeholders Group (CSG) has endorsed the abrogate petition, and CSG board member Ben Horner believes this petition stands the best chance of making the 2016 ballot if additional funds and grass root support. Deadline for turning in the Abrogate petition is this Fourth of July. "This poll is yet another indication that the era of marijuana prohibition is quickly coming to an end. A growing majority of voters supports legalization, and that's especially true of young people. While harsh drug policies have been waged in the name of protecting youth, we've seen that young people actually bear the brunt of these laws through extremely high arrest rates and collateral punishments like the loss of college financial aid. This new data shows that if legalization gets on Michigan's ballot this year it is likely to pass, and the votes of college students who are fed up with the current failed policy will play a big role in making that happen."